Are ethics divinely-inspired or man-made? Are there absolute morals? Although scientists and philosophers have debated the nature of ethics for hundreds of years, developments in genetic research have unleashed a firestorm of issues concerning human control of creation and its impact on our future. Given that society ideals change over time, how can we determine what is morally right or wrong? 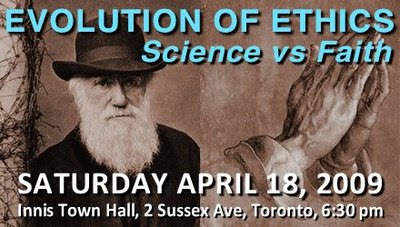 Join Humanist Canada for a lively and thought-provoking debate on the nature of ethics. Five prominent speakers, from both the Christian and Humanist communities, will discuss and debate some of the hottest topics today including abortion, gender, homosexuality, and biotechnology. Our panel of speakers includes: Christopher diCarlo (celebrated professor of Philosophy of Science and Bioethics; founder of "We Are All African" Campaign); Michael Coren (outspoken Christian writer; radio and TV host); George Dvorsky (popular transhumanist; animal rights activist); Tony Costa (recognized public speaker for Campus for Christ); and Jean Saindon (award-winning professor of Natural Science and Technology). Speaker profiles below. Tickets: $15 Humanist Canada members; $25 general admission; $10 students (with school ID). Appetizers, desserts and drinks included. Purchase tickets by April 15 for best seats. Click HERE for the printable registration form or click on ticket choices below. Nice blog! Love your post.